International cuisine restaurants - If you miss your home..
Les Creations de Narisawa; we cannot miss the name of this restaurant, when we talk about the best French restaurants in Tokyo or in Japan. The restaurant is awarded 1 star by Michelin guide and on this April, it was elected to"The best restaurant in Asia" as well as the top 20th of The S. Pellegrino World's 50 Best Restaurants 2009. This is the second time for me to have lunch here and is the first time in last one and a half years. Some of my friends have a passion for having meals at Les Creations de Narisawa. The menu list reminds me the chef, Mr. Yoshihiro Narisawa's creativity. Let's see with my photos. One of Amuse- bouche very fresh radish with soil? No it looks like soil but not real soil. 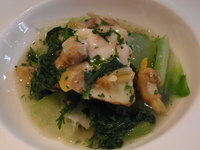 Everyone is fresh and surely has pure strong flavour of vegetables. Shellfish gathering on beach is one of seasonal events in Japan. The plate reminds everyone the exciting events in childhood. The green bed is made of sprouts or choux de Bruxelles. 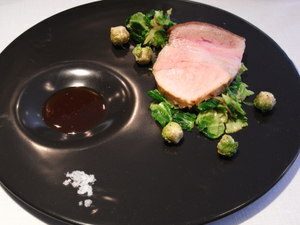 Not only the presentation but also the quality of ingredients, pork and sprounts made us very satisfied. This is actually a kind of spread to be put on a piece of bread. Our surprises continued to the two dessert plates. What the restaurant is pushed to The World's 50 Best Restaurants must be his creativitiy. Every time we go, we encounter new surprises time by time and season by season. I am looking forward to being astonished again by his "creations." Thanks very much for that well written post. 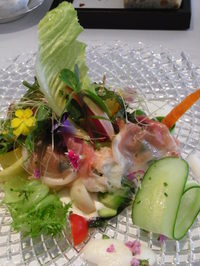 Food Tourism Japan Consulting - All Rights Reserved.